State Secretary Christian Luft from the Federal Ministry of Education and Research (BMBF) and the President of the German Commission for UNESCO (DUK), Prof. Dr. med. Maria Böhmer awarded 32 learning sites, 43 networks and 6 municipalities for their outstanding commitment to education for sustainable development on 28 November in Bonn. 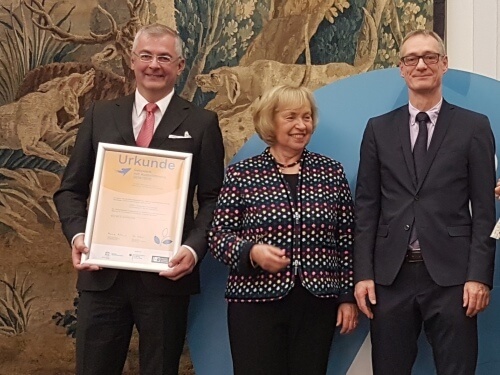 Since 2016, the BMBF and DUK have been awarding educational initiatives once a year as part of the national implementation of the UNESCO Global Action Program on Education for Sustainable Development. The selection is made by a jury consisting of members of the National Platform ESD as well as representatives of the BMBF, Freie Universitaet Berlin and DUK. In addition to learning content, methods and learning processes, the distinguished actors align their entire actions to ESD. They also orient their own management to principles of sustainability. Thus, they contribute to anchoring ESD structurally in the German education landscape. As an official contribution to the Global Action Program, they are now available on the website of the → ESD portal and benefit from the exchange with other stakeholders in a broad knowledge and practice network. In addition, Freie Universität Berlin and DUK provide advice on initiatives relating to further development in an advisory capacity.